Investigators confirm suspicions that Hanukkah menorah, left unattended overnight, was cause of tragic fire that killed 4 in Brooklyn. The deadly fire which killed four members of an Israeli-American family in Brooklyn’s Sheepshead Bay neighborhood early Monday morning was the result of a Hanukkah menorah left to burn unattended overnight, investigators confirmed. Authorities reported on Monday that they were investigating the possibility that a menorah on the first floor of the Azan family’s house may have been responsible for the deadly blaze. “This may be the source of the fire because it was in the room on the first floor where the fire was predominately contained,” a law enforcement official told the New York Post. Later on Monday, Fire Department of New York officials confirmed that the fire was caused by the menorah. The family had placed a two-foot wide menorah by a window on the first floor of their Sheepshead Bay home, and let the oil in the glass holders continue burning overnight. Investigators say the exposure of the heat over an extended period of time eventually shattered the glass, splashing burning oil and sparking the deadly blaze. The fire spread within minutes, filling the house with smoke and trapping most of the 8-member Azan family on the second floor. 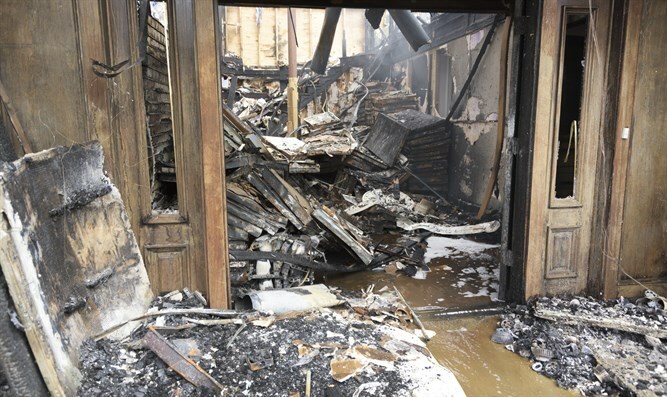 While 13-year-old Avraham and a cousin who had been sleeping on the first floor were able to escape without injury, Aliza Azan, 39, and three of her children, ages 11, 7, and 3, perished. Joseph Azan, Aliza’s husband, managed to reach two of his teenage children, and jumped from a second story window to safety. All three suffered burns and smoke inhalation. All three are currently being treated at Staten Island University Hospital. Joseph is in critical condition, while his daughter Shilat and son Daniel are in serious condition. The Fire Department of New York said Monday that Joseph Azan likely saved two of his children’s lives – while risking his own. A funeral service was held in Brooklyn Monday night for the four members of the Azan family killed in the fire. Their remains will be flown to Israel and buried in a Holon cemetery on Wednesday.